Mr. R and I have been in Boston a little more than three months now and are slowly breaking in our new apartment. Feeling at home has been taking a little longer than I was hoping since one or both of us has needed to fly out of town almost every weekend since we moved, but this past weekend we had a bunch of firsts. We spent our first Friday night downtown and ensured a waffling tourist that staying in the Mike’s line was better than defecting to Modern Pastry; we hung our first pictures; we unpacked the Mikasa dishes from our wedding shower that we’ve patiently waited 4 yrs to use; and we hosted our first dinner guests. Granted, they were only Mr. R’s parents so I didn’t feel too much pressure to pull out the vacuum or unpack the last languishing boxes. This time of year, it’s easy to fall into a rut of apple desserts. Apples are in plentiful supply; I have two crisper drawers full, and I’ve already made apple bread pudding, apple crisp, apple cider doughnut muffins, and apple cider pie. So even though apple desserts are a sure hit with Mr. R’s dad, I decided to look for some other inspiration. 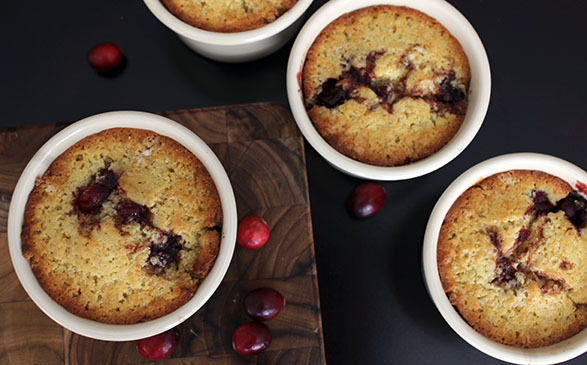 When I flipped to a recipe for maple syrup sweetened cranberries topped with a rustic cornmeal cake batter in “Sinfully Easy Delicious Desserts” by Alice Medrich, I knew I had found the perfect apple-less New England fall dessert. 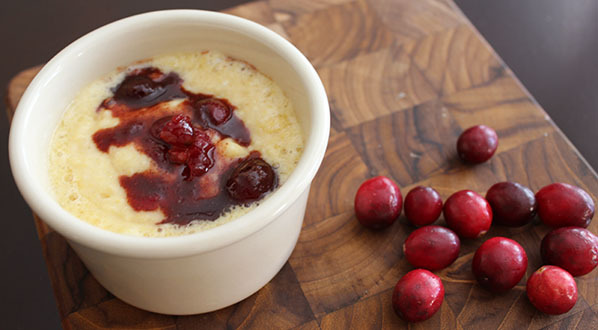 Wikipedia confirmed the classic New England roots of this recipe in it’s use of traditional ingredients like cornmeal, cranberries, and maple syrup. It also informed me that the early Puritan settlers were avid bakers, a tradition I’m happy to keep alive. I shared a cookie recipe adapted from another Alice Medrich book a few posts ago. That book has quickly become a favorite on my shelf; every recipe I’ve tried so far has been reliable and wonderfully tasty. So when I saw this one on clearance at a bookstore in Portland, I was determined to find space in my suitcase to bring it home (or rather Mr. R commanded me to buy it so he didn’t have to hunt down an out-of-print copy at Christmas time; something he’s gotten rather good at, I must admit). I have no regrets. The goal of this book is to share tasty but easy desserts; recipes that need little more than what is already in a well-stocked pantry* and place limited demands on time or foresight. So after a day of visiting open houses, this recipe came together with little fuss in plenty of time for guests. The only surprise was that this pudding wasn’t very sweet. I expect tartness from cranberries; but as I took my first bite of the cornmeal cake on top, I had to get up from the table to check the recipe. Had I really forgotten to add the sugar? I had not; the recipe calls for no sugar beyond the 1/3 cup of maple syrup used to take the pucker-inducing edge off the cranberries. Since I prefer my desserts a little sweeter (and was glad we had picked up some maple frozen yogurt and vanilla ice cream to serve alongside), the pudding struck me as something that would be awfully tasty served for breakfast topped with a drizzle of warm, lightly sweetened half and half or maple syrup. Mr. R’s mom suggested a holiday breakfast would fit the bill perfectly. So with Thanksgiving and Christmas not far off, I’m sharing this recipe for the upcoming family gatherings. Breakfast or dessert, sweeter or not; I’ve written two recipes below depending on how you want to serve it. What’s easier than one satisfying recipe serving two purposes? I’ve given enough of an intro to this recipe already, but I highly endorse it and will certainly be serving it for an upcoming holiday brunch. For breakfast follow the directions but omit ingredients in parenthesis; I recommend serving with warm maple syrup and lighlty sweetened half-and-half. For dessert include additional sugar and top with a healthy scoop of ice cream – vanilla, maple, cinnamon, etc all will fit the bill. This recipe should work well gluten-free too, just substitute your favorite gluten free baking mix in place of the flour. Preheat your oven to 400°. Select a ceramic or glass* 2 qt baking dish, 9-10 inch pie plate, or 5 ramekins and warm it in the preheating oven. 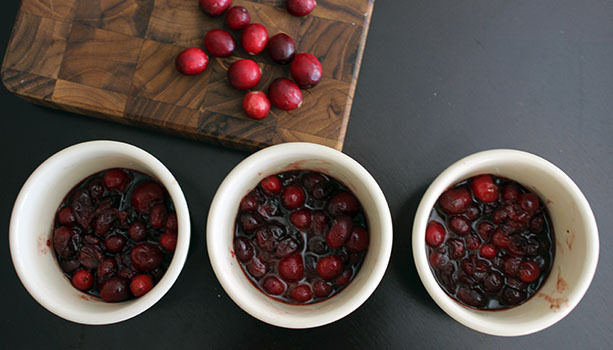 Combine the cranberries, water, maple syrup, and spices in a medium sauce pan and bring to a simmer over medium heat. Add in brown sugar if you are making the sweet version. Simmer for a few minutes (no more than 5) until the cranberries start to pop and the juices thicken a little. 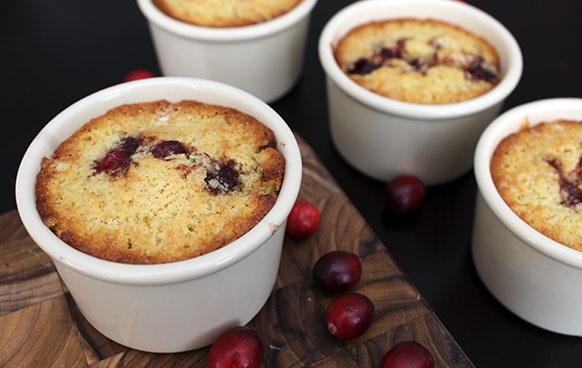 Don’t worry if they look too wet, cranberries have a lot of pectin and will thicken up during baking. Turn off the heat and spoon the berries into the warm baking dish. Reserve ~1/2 cup berries for later and mix with the cornstarch if using. Return the dish to the oven. Whisk together the flour, cornmeal, salt, and baking powder in a medium bowl. Add in the granulated sugar if using. In another bowl, whisk together the egg, milk, melted butter, and vanilla. If your egg or milk are too cold, your butter may re-solidify and make the mixture look clumpy. Microwave for 10 second intervals, mixing in between until the butter liquifies again. Don’t microwave too long or you may cook your egg. Combine the wet and dry ingredients and mix just until combined (mixture will be wet and loose looking). 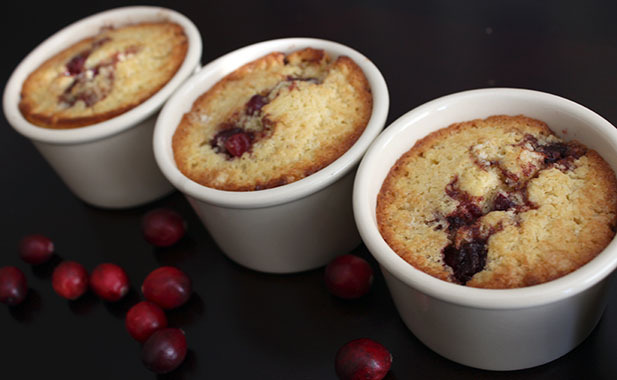 Remove the baking dish from the oven and spoon the batter over the cranberries to cover. Spoon the reserved cranberries and juices over the top of the batter. Adding cornstarch at this point will help keep all the berries from sinking into the batter during baking. Return the dish to the oven and bake for 20 minutes until the cake has puffed up and the edges are browned. Remove the cake and serve warm. * She offers good advice on what’s too keep in a well stocked pantry too if you want to start thinking like a baker. * Something non-reactive. 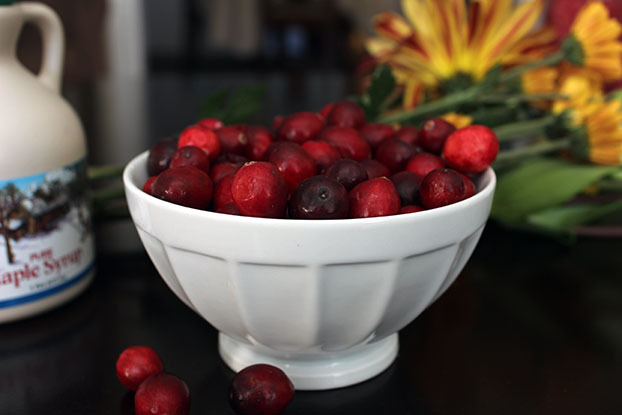 Aluminum or other metal baking dishes will not play nice with the acidic cranberries and you could end up with a metallic tasting result.